Profiteroles are delicious little choux. Perfect for V Day. You can found these French specialities filled with almost anything. The most common ones are filled with vanilla ice cream or pastry cream with different flavours. 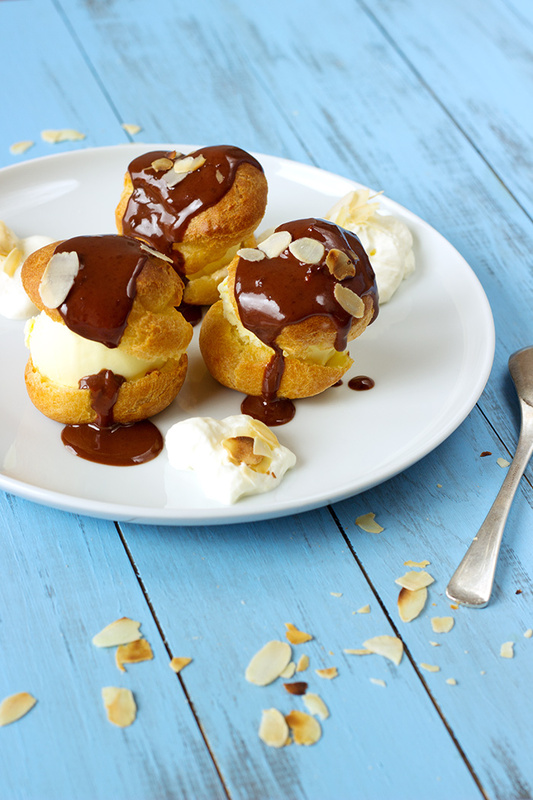 Today recipe is one of the classics: Profiteroles with vanilla ice cream and chocolate sauce. I made those with industrial vanilla ice cream because when I am done making my choux I am usually tired. We will begin with the choux paste and finish with the chocolate topping. You can also add some Chantilly with it. Even more delicious. This is the perfect recipe to end with a French touch on Valentine’s Day! 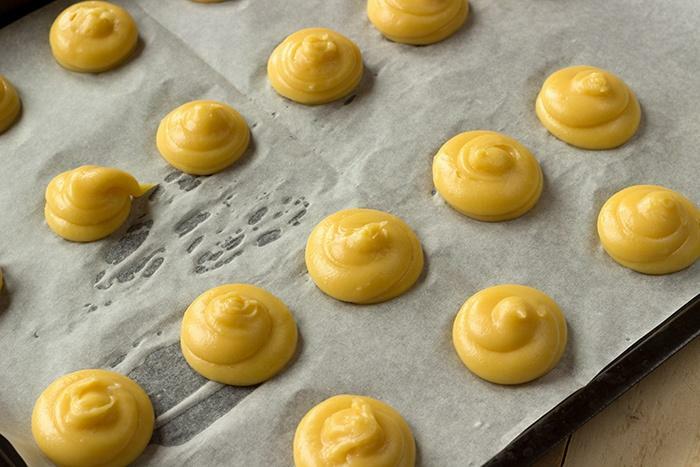 The choux paste is not exclusively used to make profiteroles. You can also check my chouquettes recipe or my stunning chocolate eclairs. Prepare all ingredients and preheat oven to 200°C (400°C). Dice butter. Bring to a boil water, sugar and butter in a medium saucepan. Remove from the heat and add flour all at once. Stir quickly and heat few seconds to obtain a ball not gripping. Pour mixture in a mixing bowl. Add first egg and mix to obtain a paste, second egg and stir, third egg and mix and finaly the last egg and mix. Fill in your pastry bag with the choux paste. Put a greaseproof paper on a baking tray. Make your choux. Bake for 15 minutes and low down temperature to 180°C (350°F). Cook for another 10 minutes. Do not open your oven during baking process or your choux will not rise. Dice chocolate. Add dark chocolate and cream in a little saucepan. Put in a larger saucepan filled with a bit of water to cook au bain marie (water bath). Stir regularly to obtain your chocolate sauce. Cut your choux in two parts. 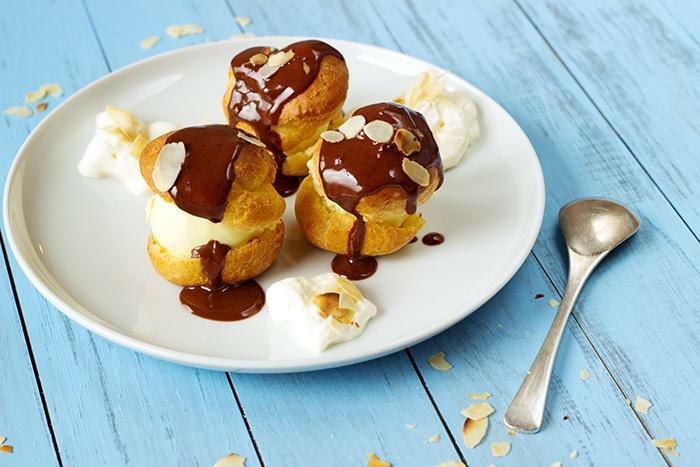 Put a ball of ice cream in each choux and pour chocolate sauce over them. They look stunning! Thank you for sharing these beautiful pictures and the great recipe! Thank you for reading it Bridget.